Send your Oil and Gas Accidents claim to a lawyer who will review your claim at NO COST or obligation. It is important to seek advice from oil and gas attorneys because determining liability can often be difficult, and Worker's Compensation may not cover all the expenses associated with long term serious injuries. An oil and gas lawyer can review your employment documents thoroughly to determine any indemnification clauses that may waive the liability of the employer, contractor or other third party. In 2006, almost a half million people in the US were working in jobs related to the oil and gas industry and the gas extraction industry employed about 400,000 workers on both offshore and land drilling and workover rigs, comprising the largest part of the US mining industry. The oil and gas industry is growing but at the same time increases in oil and gas activity correlate with an increase in the rate of fatal occupational injuries, particularly when inexperienced workers are not sufficiently trained in safety and precautionary measures. The most common types of injuries are burns, brain injury, spinal injury and fractures. Nearly half of all fatal injuries were attributed to highway motor-vehicle crashes and workers being struck by machinery or equipment. Gas explosion injuries, fires, chemical burns and dangerous falls or falling objects or equipment-- workers are often hit on the head or back by tools or equipment—are just a few of the dangers occurring on a regular basis in the oil and gas industry. According to a recent report, "Assault on America: A Decade of Petroleum Company Disaster, Pollution, and Profit", from 2000 to 2010, the oil and gas industry accounted for hundreds of deaths, explosions, fires, seeps, and spills. This report, which includes a full List of Oil Disasters from January 2000 – June 2010, demonstrates that the BP incident is not isolated but an industry pattern that places profit ahead of communities, local economies, and the environment. In this video, Tim Warman, National Wildlife Foundation, discusses how the oil and gas industry must be held more accountable by removing the liability cap. Oil companies make trillions of dollars in revenue—more than enough to cover oil and gas accident lawsuits. Gas explosions can also occur in the home; they can be caused a defective product or combination of defective products; or minimal or no public or consumer information on the safe handling and use of propane or natural gas. Approximately 26 million people use propane: it is also very dangerous. More than 100 million people use natural gas. You are four times more likely to be involved in a fire or explosion using Propane (LP Gas) vs Natural Gas (Methane). You are 13 times more likely to be severely injured or burned with Propane vs. Natural Gas. You are more than 100 times more likely to be killed or severely injured if there is a product failure using Propane vs Natural Gas. April 2: Seven workers were killed in a fire at Tesoro Corp's Washington oil refinery.. Federal investigators say the victims were likely engulfed in"a firewall" that ignited within seconds. April 19: A worker was killed at Motiva's oil refinery in Port Arthur, Texas in a construction crane accident. Motiva now has two fatalities since 2007 at this refinery while it has been attempting to expand production. April 20: Possibly the worst environmental disaster in U.S. history, BP's Deepwater Horizon Oil Spill stemmed from an explosion that killed 11 rig workers and injured 17. On Jan 11, 2011, the White House oil spill commission's final report on the oil disaster contained recommendations including raising the liability cap for drillers and creating an independent safety agency. An independent safety agency be created within the Department of Interior headed by an official shielded by political interference with a fixed term. The official should have energy and engineering experience and the agency should have enforcement authority to oversee all aspects of offshore drilling safety. Drilling operators should be financially responsible for the consequences of failure. The current $75 million cap on liability for offshore facility accidents is "totally inadequate and places the economic risk on the backs of the victims and the taxpayers," the panel said. The cap should be raised to place the burden of catastrophic failure on those who will gain economic rewards from drilling and to compensate innocent victims. The report said that "Provisions can be made to ease the burden on small-scale operators ... including mechanisms for sharing risk such as insurance pools." Existing U.S. drilling regulations should be expanded to address all features essential to well safety, and should be updated to ensure safer drilling in all U.S. offshore operations. The new regulations should be supplemented by a "risk-based" regulatory approach that requires all offshore drilling companies to show they have evaluated all risks associated with drilling a particular well and are prepared to address any and all risks pertaining to that well. Broader consultations among federal agencies, including the Coast Guard and the National Oceanic and Atmospheric Administration, prior to leasing and exploration to help identify and address risks. Congress should amend the Outer Continental Shelf. "Adequate and predictable funding for regulatory oversight is essential for the reforms to be effective and to meet the challenges of ensuring offshore safety and environmental protection," the report said. Budgets for the regulators that oversee drilling should come directly from fees paid by the companies that are being granted access to a publicly owned resource. Funding sources could include a regulatory fee on new and existing leases or an increase in the inspection fees already collected by the Department of the Interior. Texas Oil and Gas production is booming and is expected to reach an all-time high by 2016, mainly due to Texas oil and gas drilling. Greater production means a greater increase in jobs, but rapid development—particularly in South Texas oil and gas-- means that more workers are subject to injury. Texas oil and gas lawyers are increasingly seeing more accident and injury claims as oil and gas companies increase their rigs, often with unskilled well drilling and well maintenance workers. Combined with the physical demands of the job and long shifts (roughnecks often work 72 hour shifts), workplace accidents are bound to occur. Furthermore, some companies are in such a hurry to increase production that they may fail to disregard OSHA safety standards or fail to properly maintain equipment. Common causes of oil and gas accidents include inadequate safety training and disregard for safety measures, defective equipment and improperly maintained equipment. While injuries are covered by Workers Compensation, the Texas law of oil and gas ensures that companies and contractors are held responsible should negligence occur. 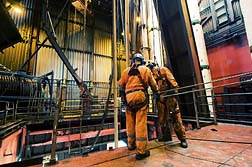 OSHA safety standards protect drilling rig workers both onshore and offshore, but companies often disregard rules and regulations. Federal statistics count 1,300 drilling rig injuries in the Gulf of Mexico from 2006-2010, and 41 worker fatalities. (Eleven deaths were the result of the BP Deepwater Horizon explosion and 15 deaths at the Texas refinery explosion in Texas City.) According to the Bureau of Labor Statistics, in 2008 Texas had more fatalities in the oil and gas extraction industry (41) than any other state. The Eagle Ford Shale, a gas basin extending through 30 counties-- including Hood, Johnson, Parker, Tarrant, and Wise Counties-- is one of the largest oil and gas reserves ever found in Texas. The formation produces from various depths between 4,000 and 12,000 feet and is benefiting from "high liquids yields across much of the play." The state of Texas reported that natural gas production at the Eagle Ford shale has increased ten-fold from 2009 to 2010. Along with oil and gas prices, controversial Eagle Ford Shale drilling methods, i.e., Hydro Fracking and horizontal drilling, have resulted in a rapid expansion of oil and gas companies (more than 24 oil and gas companies are currently in the Eagle Ford Shale Patch). According to Mark Sundland, drilling manager for Anadarko Petroleum, horizontal/directional drilling and hydraulic fracturing "has put Eagle Ford in a class by itself". Hydro-fracking also poses public health concerns. Environmental groups are concerned that the fracking water may pollute drinking water. Fracking requires millions of gallons of chemically treated water that is mixed with sand, to blast through the shale, which then releases gas or oil. Even one well can require millions of gallons of water. The EPA has investigated fracking' effects on drinking water in other parts of the US and is now looking at the Eagle Ford Shale. With this oil and gas boom comes an increase in workers, some of whom are unskilled and untrained in safety procedures. (Recently OSHA opened an investigation following a Sept 2011 accident where two people were hospitalized after an oil rig explosion on the Eagle Ford Shale.) Most oil and gas injuries are avoidable yet safety is often secondary to oil and gas profits. In 2008, 31-year-old Larry Mullins Jr., an employee at Nabors Drilling USA, was working on a drill site location and was crushed by oilfield equipment being positioned by a tandem truck in a rig move in Wise County, Texas. In April 2010, the Mullins family settled an oilfield accident lawsuit for $9.5 million dollars. 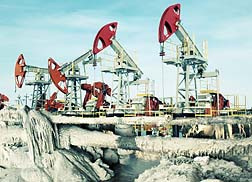 In 2007 the Usumacinta jack-up oil rig was positioned over the Kab-101 platform. Strong winds forced the jack-up off location, causing it to collide with the Kab-101 platform and rupture the platform's production tree. Twenty-two workers lost their lives as a result of the emergency evacuation in storm-force conditions. The leaking hydrocarbons ignited twice, causing major fire damage to both the Usumacinta and the Kab-10. In 1998 an employee of Marine Drilling Company was working on an offshore jackup rig when a piece of equipment severed his hand. A lawsuit was filed against Mar- Dril, Inc, Storm Drilling Company Freeport- McMoran and Directional Wireline Services, and an out of court settlement for the offshore drilling rig accident was reached. If you or a loved one has sustained an oil and gas injury, you should seek legal help. An oil and gas attorney can review your accident against safety regulations to help uncover what happened, and who is responsible, to ensure that you obtain suitable compensation for your workplace accident injuries. California Ocean Fracking: Another Fraccident Waiting to Happen? Ohio Gas Pipeline Explosion Lights Up Sky for..
Attorney Says Fairport Harbor Victims Need He..
Three Dead, Homes Destroyed in Allentown Gas ..
My father was killed on a nabors drilling rig in April of 2009 in North Dakota. We later discovered that nabors had modified that specific rig to fit their needs at the time.it clearly violated safety laws and regulations. I heard not long after the accident occurred they had modified it again and theye put the rig back out and had it operating. Also, they didn't have the pin in that's is suppose to be holding the Derrick in place, and they were only using a 3/4 inch chain to hold the Derrick in place, and they had the thing sitting there not properly secure what so ever for over 24 hours... sad that it wasn't even my father's truck he was only helping another employeemail chain down and was crushed by the Derrick that swung down because there was no pin holding the one side and the tiny chain that was used to hold the other end of the 9,000 lbs Derrick snapped. It is a shame to see how many violations that are discovered, and the amount of safety regulations being violated every day. The unreversable damage and the tragic number of lives lost is heartbreaking. There should be more being done to in force these safety laws so that hopefully one day the number of rig worker fatalities may begin to decrease. Thank you to all the oil field workers that risk their lives daily and RIP to all the men who've lost their lives doing this job! I know the unbearable pain when an officer walks up to inform you that you have lost a loved one. And it gets more overbearing when you discover it was due to lack of safety regulations being met. So my thoughts and prayers are with the family's of those killed.